Globetrotting Never Smelled So Good! Have you ever eaten something that reminded you of a favorite meal- perhaps at a small bistro in Paris? Or maybe a certain wine brings fond memories of a river cruise through Burgundy. In much the same way, fragrances that linger on the skin for minutes or hours can evoke feelings of happiness, joy, playfulness, or a host of other emotions. Just as a chef might orchestrate a dish using precise, flavorful ingredients or a sommelier will use their senses to identify the origin of a fine wine, so too does a perfumer use these sense tools in creating unique aromatic fragrances. In this case, the ingredients, called notes, are derived from a variety of raw materials, many of which are found in nature. These may include citrus smells such as lemon, orange, or bergamot; fruits like apple, cherry, or coconut; or white flowers like gardenia, lily, and jasmine. The combinations used can also include nuts, spices, herbs, resins, and even sweet scents that might make you think you just ate some chocolate, toffee, or sorbet. Knowing how to extract and blend any of these into a unified, memorable perfume or fragrance that the public will embrace is a true skill that encompasses science, emotion, and creativity. Here are six of some of the newest artisan global fragrances that will have you packing your bags for your next travel adventure or flight of fancy. Revealing both a masculine and feminine side, Peau de Pierre was made for a perfect Sunday wandering through an art museum in Paris such as the Pompidou Center. Rather than revealing his notes, Starck prefers to offer a more ethereal explanation for his scents: A mysterious space between, between what we know and what we do not yet know. 90 ml./3 fl. oz. eau de toilette (men), $150, Available at lordandtaylor.com. The night sky over the Italian countryside was the inspiration for this perfume. Created by Paolo Terenzi as part of his Luna collection, the packaging itself is a work of art. The cap is adorned with 24 karat gold accents and features imagery from the various constellations. The moon, in the mind of Terenzi, is the place of “lost memories, wishes, and desires.” Orion was one of the heavenly constellations always pointed out by Terenzi’s grandfather while sailing on Italy’s glassy bays and thus became the latest member of the collection. The top notes combine the scent of a Mediterranean breeze with wisps of bergamot, red current, apple, and pineapple. Middle notes include jasmine, patchouli, and birch while the base scent lingers with incense, amber, agarwood, and musk cedar. 100 ml./3.38 fl. oz. extract de parfum natural spray (unisex), $235, Available at barneys.com. The Palace of Versailles becomes the center stage for this perfume in remembrance of the court of Louis XV, known as “The Perfumed Court.” During the 18th century, fragrance production was at an all-time high with the French cities of Grasse and Paris leading the way. King Louis was so enamored with aromatics that he ordered the royal apartments to be scented with a new fragrance each day. Horse racing was one of the premier sports at the palace. In honor of his great grandfather Louis XIV, Louis XV appointed a work of art known as the Marly Horses in 1739 and placed the sculpture in the water gardens of the Château de Marly. After applying Layton, your senses may pick up notes of lavender, apple, and mandarin orange. These are followed by jasmine, violet, and geranium. As these settle in, new notes enhance the previous with guaiac wood, patchouli, sandalwood, cardamom, and vanilla. 125 ml./4.2 fl. oz. eau de parfum natural spray (unisex), $290, Available at nordstrom.com. 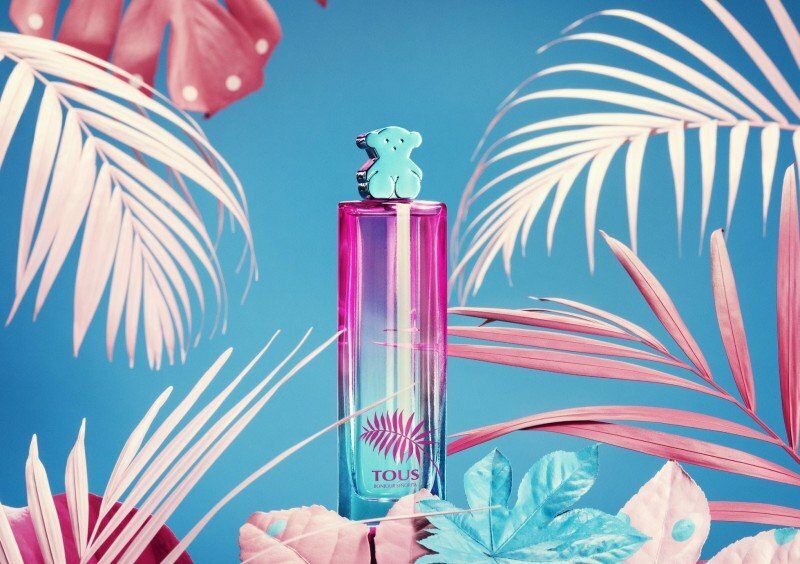 A Caribbean dream is probably the best way to describe this new eau de toilette spray from Tous. The floral and fruity fragrance captures the essence of a tropical vacation from St. Kitts to Havana. The Tous family has been making jewelry in Spain since the 1920s. Their commitment to old-world craftsmanship has made them one of the world’s most successful jewelry and accessory brands. Nathalie Norson created this feminine scent, which opens with a delicious blend of mango and bergamot with a whiff of raspberry macaron. The heart notes include coconut milk, guava, and jasmine tea, which give way to a base of tropical woods, patchouli, and a hint of vanilla. What could be better than taking a romantic road trip through New England to view the colorful fall leaves? Doing this while wearing the American heritage fragrant aroma of the Elixir of Love No.1, that’s what. Developed by Caswell-Massey, who has been creating engaging fragrances as well as bath and body products since 1752, the formulation was based on an old and mostly forgotten Victorian blend found hiding in the archives. Known back then as the original potion for love everlasting, it owes its sensory prowess to the passionflower, which only blooms one day each year but inspires a love that lasts forever. Notes include flower scents of jasmine and lavender, Egyptian musk (a fabled aphrodisiac), and, of course, passionflower. Can it really enhance love? Only you can tell. 50 ml./1 fl. oz. eau de toilette (women), $40, Available at caswellmassey.com. Bring the scents of Scandinavia into your home with Skandinavisk’s Hygee Mini Scented Candle. Using different elements of local life, climate, and environment, the candlemaker infuses each of the candles in his collection with a story of the region. Three of the candles best exemplify the essence of the Scandinavian lifestyle. Skog, for example, reflects the boreal forest, which traverses much of the country. Hav embodies the fresh, cold seas that surround the land masses. Hygee (pronounced Hu-gah) is a Danish word with no direct translation but conveys the idea of cozy living and the appreciation of the small, memorable moments of life. Drawing its notes from local sources, Hygee will enchant you with the aromas of tea, baked strawberry cake, rose petals, and a splash of mint. Made with pure vegetable wax and hand poured into a glass votive, the candle will provide 50 hours of enjoyment. Scented candle 55 grams, $21.00, Available at skandinavisk-usa.com.